Although relatively obscure today, Kate Harris was a prodigious turn-of-the-century designer. She created numerous designs for William Hutton and Sons, a firm supplying fine silver works to the progressive London department store, Liberty and Co. In 1900, Harris' work was also featured in the prestigious Paris Exposition Universelle, the World's Fair that introduced an adoring public to escalators, Ferris wheels, the Eiffel Tower, and Art Nouveau. Many early 20th century designers looked back rather than forward for inspiration; Harris cheerfully embraced the encroaching modern age. 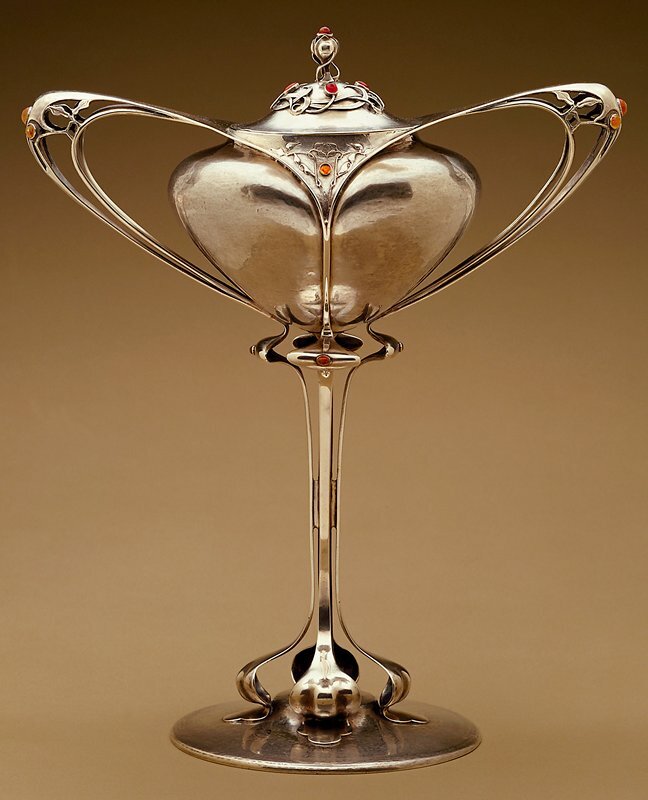 This magnificent cup embodies the Art Nouveau style as practiced in France and Belgium, with exaggerated, tendril-like handles growing out of the shouldered cup form, and sweeping down from the stem, executed in long, elegant lines. Kate Harris; Manufacturer: William Hutton &amp; Sons, Ltd.